Of all the packages I was actually looking forward to today, a human skull emblazoned with a secret code for an in-game Warhammer Online item was definitely not one of them. Being a member of the video game press is fun, especially when simulated human remains wind up on your doorstep. My cats really appreciate this, as they are now running about chewing on hay and batting around the mummy wrapping I had to unfurl in order to reveal the Cartouche on the skull's forehead. Unravel the mystery of the Cartouche, and you could win one of 1,000 limited edition Scarab Amulet rewards Mythic is issuing to mark the launch of The Land of the Dead zone in Warhammer Online later this month. Mythic is only issuing 5,000 Scarab Amulets, which summons a swarm of beetles that swirls about your character, with 1,000 tied to each skull. 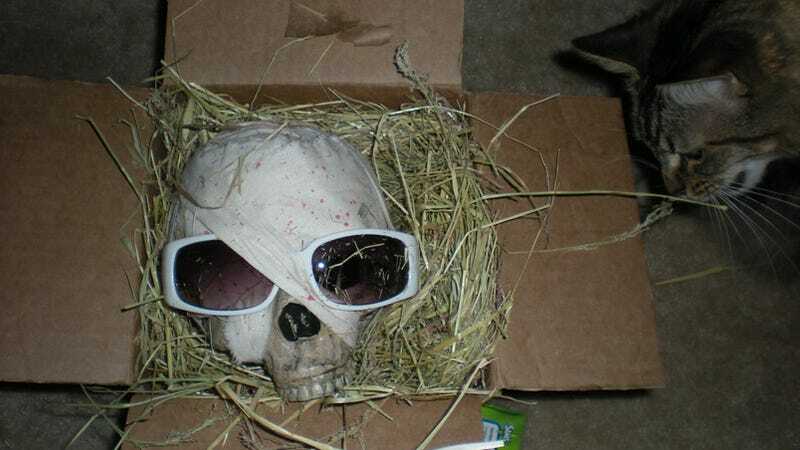 We're apparently one of five websites to receive one, which seems like a small number, but knowing four other people are opening boxes with skulls in them across the country makes me feel a little better. So, how do we solve this code? Apparently the key to the cartouche has been broken up and scattered across the Warhammer Online blogosphere, meaning you will have to hunt, or wait until someone posts a link that shows up in Google. Once you've deciphered the code, you can visit your Warhammer Online account page to redeem it. So, your task, should you chose to undertake it (Get it? Undertake? Skull? Is this thing on? ), is to figure out what the symbols in the picture below mean. My task? Unwrapping the howling cat from the bandages he's managed to get tied around his legs. Ready? Break!